Few Kansas City bands have been not only respected but embraced by critics, fans, and fellow musicians of many genres the way The Grisly Hand has over the past few years. Formed in 2009, the band released the album Safe House in 2010, Western Ave. EP in 2012, and then followed those with the stellar and regionally successful Country Singles in 2013. The latter cemented The Grisly Hand’s position as one of the best acts in Kansas City, and probably should have launched them onto a national stage. There may be just one slight problem—they don’t exactly fit the mold of any one genre. Typically billed as Americana, the band’s first three releases were undeniably country music. Not the contemporary crap you avoid at all costs on your radio dial, but more traditional twang, with perfectly harmonized vocals, pedal steel guitar, mandolin, a potent walking bass, and shuffling beats. It’s not cry-in-your-beer country, but mainly up-tempo tunes that—like a lot of old-school southern music—contain elements of rock, soul, and pop. Music that, despite its wide local appeal, is not exactly sought after by major record labels. 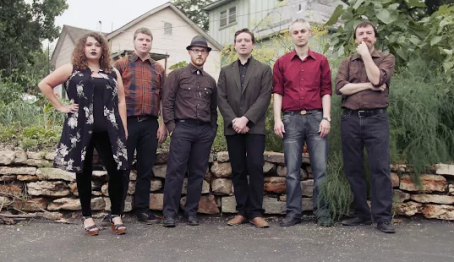 The Grisly Hand’s latest offering, Flesh and Gold, is a different direction for the group. There is an obvious attempt to lessen the country feel by moving to a more straightforward rock ‘n roll sound than present on previous albums. There’s a bit less twanging and a little more banging, but the songs are still well-crafted. Lead vocalists Jimmy Fitzner and Lauren Krum (Ben Summers takes the mic on the third track, “Regina”) harmonize like two people who have spent their entire lives singing together. The musicianship of Fitzner and Summers (guitar and guitar/mandolin, respectively), along with Mike Stover (pedal steel/bass), Dan Loftus (bass/keys), and Matt Richey (drums) continues to be top-notch. Flesh and Gold opens with the familiar, beautiful ring of Fitzner and Krum, singing in front of a lone electric guitar on “Get in Line, Stranger.” The rest of the band soon kicks in, and the song proceeds to become what the majority of the album is—a very solid collection of catchy, mid-tempo, alt-country tunes; some of which could be accused of leaning towards (gasp) pop rock. Possibly the most enjoyable cut on the album is the no-nonsense, driving rock song, “Regina.” Summers’ vocals, though not quite as refined as Fitzner’s, are laced with passion as he sings about the insecurities and immaturity of youth. “You probably don’t want to follow me down, because I’m a fucked up kid without a plan / Shows me why you do the things you can.” The track is vibrant and pulsating—Krum’s backing vocals give Summers’ voice some added depth, and Stover’s killer steel guitar solo supplies just enough southern touch. This could be a very radio-friendly song. Some risks are taken by tackling a couple of heavy topics. “Brand New Bruise,” a ballad turned barroom blues rocker, is about a woman with an abusive partner. I was prepared for a clichéd country triumph about a gritty woman teaching her old man a lesson. Instead, the song reveals a sad dose of reality; a worn woman who doesn’t know where to turn. “You can say you’re sorry again, you can bury me down in the ground / Just know whichever way you choose…either way I lose.” “Satan Ain’t Real” is perhaps a jab at Christianity and the guilt it causes, or maybe just a way of telling people not to be too hard on themselves or each other. “Satan ain’t real, it’s just what we blame when we can’t explain why fellow men hurt us like they do, without remorse / Just know it’s all in your head, and it ain’t ever too late for you to break away.” The song is also one of the more intriguing numbers musically. Somewhere between a Bossa nova and a Cajun ditty, the relaxing groove, filled with mandolin and steel guitar, implores the listener to set their troubles aside. Flesh and Gold is a very good standalone album. There isn’t a single song that isn’t thought out and dialed-in, as any fan would expect. Had I never heard any of the The Grisly Hand’s previous work, I would go as far as to call this output great. However, I know what the band is capable of, and couldn’t help longing for a few of the things that made Country Singles so special. For example: the dialogue between Fitzner and Krum on “(If You’re Leavin’) Take the Trash Out [When You Go],” the infectious energy of “If You Say So,” or the moving beauty of “Coup de Coeur.” Despite this, I understand the need for change, applaud the band for moving outside of their comfort zone, and feel extremely confident about the future of The Grisly Hand. Brad loves music, Boulevard beer, and his family. The Grisly Hand will be one of the bands playing a pre-game concert at Kauffman Stadium this week. They will be taking Ink’s Outfield Stage for Game 2 of the American League Division Series on Friday afternoon. They will also be playing the annual Brew at the Zoo and Wine Too! at the Kansas City Zoo on the evening of October 17.